Grab a copy of our free ebook "27 Tips on What to Say and Do"! 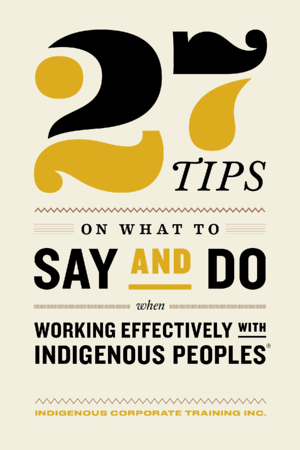 This handy little eBook is a great free resource for anyone who wants to work with Indigenous Peoples, including Indian or First Nations, Inuit, and Metis Peoples. The 27 tips are based on real life experiences from participants in our on-site and public workshops, as well as Bob Joseph's personal and professional knowledge. This compilation of tips will definitely give some great ideas to help you before your next community meeting.